Parents say hello to your new in built babysitter. Guaranteed to keep the kids in line, and not use your internet, rummage through your food, and invite their significant other over to make out. 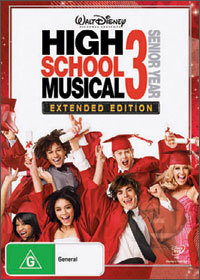 Yes, Disney sensation High School Musical is back with its third chapter, in high definition glory. High School Musical 3: Senior Year, brings back all of the main cast from the first two films and director Kenny Ortega for one final run out with an expanded theatrical release budget. This time the plot obviously concerns senior year at East High School. The Wildcats have just won their second successive championship and everyone is ready to move on and graduate. Troy (Zac Efron) has all but secured a basketball scholarship with his team mate Chad (Corbin Bleu), yet expresses doubts as to whether this is the future he really wants. Meanwhile his girlfriend Gabriella (Vanessa Hudgens) has been accepted to Stanford, which is a long way from Troys intended school. While trying to decide their respective futures, the students all agree to put on one last show for the high school, which is all about their senior year. High School Musical 3 is basically a critic proof film. The franchise is a sensation, and the audience it’s intended for isn’t really going to care what a film critic says about it. That said the increased budget shows, as everything is bigger and more elaborate. The production numbers are grander, the stages are more intricate and Ortega has a few more tricks up his sleeve to show us. The film is a light poppy bit of fluff that is perhaps a little overlong. Some of the musical numbers linger a bit longer than they should, and the whole plot is dealt with a little too slowly. None of this really matters though as the people who already love the High School Musical franchise will love this one as well. Zac Efron is a vibrant presence and will keep people in their seats. Light hearted yet also able to deal with the films more emotional moments. Efron is the breakout personality of the franchise and will surely achieve success in future projects, even if it is just girls drooling at him for 90 minutes. My girlfriend has already taken me to see his newest film for this very reason. The picture and audio are really sharp, as to be expected from a Blu Ray disc. The films bright colours look especially vibrant on a high definition TV. There are also a rather large collection of extras that are bound to keep fans entertained. Kids will love the “Sing Along with the Movie” option, which has karaoke subtitles for all the musical numbers. Beyond that is a collection of deleted scenes with an introduction by the director, a brief collection of bloopers and a large collection of featurettes. These include ones covering the costumes, the tradition of prom, a spotlight on the new cast members, a feature on the starting basketball game/musical number, a cast goodbye section, and a high school awards feature, where the cast and crew nominate each other for yearbook style awards such as best hair, best couple and so on. Lastly there are a large number of music videos of songs from a collection of different countries. High School Musical 3: Senior Year was always going to be a success with its built in fan base, but it is also a fairly entertaining throw back to old musicals. Efron and the rest of the cast are charming, and the dance numbers are well choreographed and performed. While there may be quibbles with the length, the squeaky clean “Disneyed up” version of high school, or the overly familiar and predictable plot, the fact remains that the film is a nice light hearted bit of fun. The fanatics will find everything they want from a High School Musical film, and the characters have been given a fitting send off.